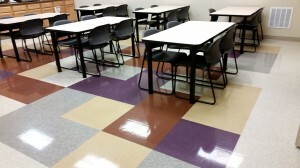 Having the knowledge of how to properly clean restrooms, breakrooms, and cafeterias is the key to getting these large areas disinfected properly. People congregate in these areas the most which makes it imperative to get these rooms as clean as possible. is the amount of time a disinfectant needs to kill bacteria. 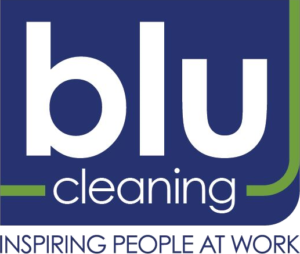 All Blu Cleaning employees are trained on proper bathroom training and dwell time to ensure a healthy environment and to reduce transmission of diseases. Toilets & urinals, handles and other touch surfaces are cleaned to reduce the risk of passing on germs. 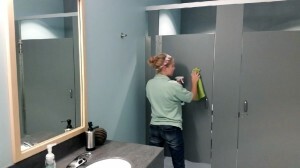 Bathroom cleaning also includes cleaning dispensers, walls, stainless steel, vents, stall walls and tops, floor boards and floors, drains, pictures, mirrors, showers, locker areas and other bathroom fixtures. We also do not use paper products to clean your bathrooms but use microfiber cloths to clean mirrors as part of our environmental sustainability. Cafeteria cleaning and break room cleaning requires proper disinfecting and sanitizing surfaces from tables to counters & backsplashes, sinks & sink handles. Sinks are cleaned daily with Crème Cleanser to remove coffee stains from the sink, drain basket & drain and also to prevent lime or calcium buildup around the faucet. Cleaning also includes wiping down chairs, cupboards & handles, the outside of appliances, the inside of refrigerators on request, vending machines, window sills, paper towel & sanitizer dispensers, water cooler equipment, floor cleaning and when done pushing in chairs and making sure the room is neat and presentable.